Thinking of their annual plea, I had to agree. Sure, a nice purse or a pretty piece of jewelry would be lovely. But, truth be told, all I ever desired, from the moment they were born, was for them to be happy. Then, it hit me. I knew exactly what they could give me. For the next nine months, I nagged, pleaded, pestered, and cajoled until they finally agreed on a date in October that wouldn’t conflict with any college football game, class reunion, wedding or another item of fun on their busy social calendar. Finally, the day arrived. They’d made a commitment to their mother that had to be fulfilled, so they sucked up their whining and played along with my enthusiasm. “First thing we need to do is buy a hat,” I announced with excitement, as we made the journey to Anaheim. For the next five hours, we looked ridiculous as we stood in lines long enough to aggravate even the most patient visitors. We ate popcorn, greasy hamburgers, french fries, churros, cookies, ice cream, and nearly threw it all up on Space Mountain. I was thrilled. 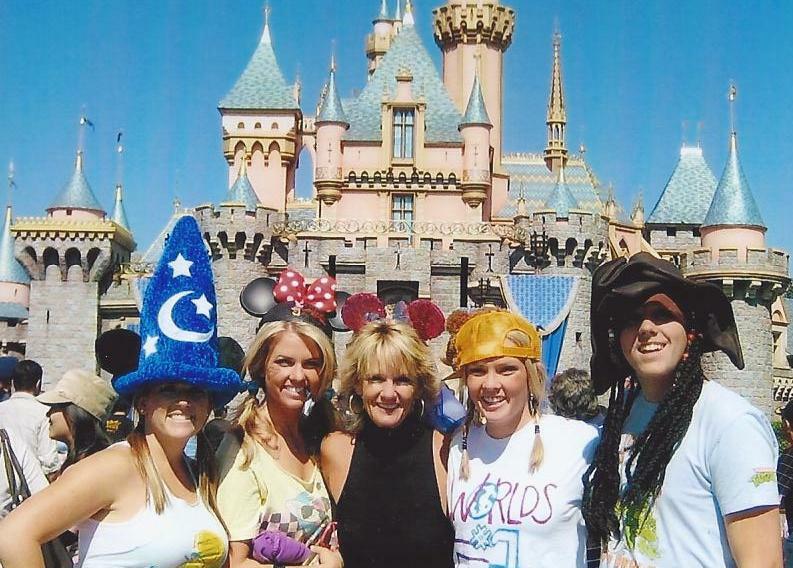 When the Haugh children were little, Disneyland was their favorite destination. Remembering the rush of excitement as we entered the park, all four went running in different directions to find their favorite ride, I couldn’t help but smile. There were pictures to be taken with Mickey Mouse, Cinderella and Donald Duck, and a belief that fairy tales did come true as we walked through the castle to Fantasyland. The Happiest Place on Earth had true meaning for all of us. Years ago, when our lives together began, we were strangers starting out on a journey to become a family. Although biologically connected, there was so much to learn about each other. Today, my children are adults with lives of their own. Going back in time, back to the beginning when I was the center of their universe, helped to link me to the person I used to be for them. It allowed me to relive and remember where I’ve been, what I’ve done, and how much I have grown – how much we’ve all grown. Reliving old memories is one of my favorites past times. Of course, I can’t go back, nor would I even want to because what’s happening in the present is so exciting, but it helps to remind me that at every stage in my life it was all good, even the difficult times. They were the chapters in my life’s book that lead me to my great becoming – who God intended me to be. After that day back at Disneyland, I decided I didn’t need to physically relive any special moments. I have boxes of photographs and videos that help me do that, and now at Christmas, my children and I appreciate a whole new meaning for gift giving. Instead of spending money on things that only find their way to the back of a drawer, we make a point of spending precious time together and put that money towards a family event or trip together. The time to create new memories to be reviewed over and over in the future is the most valuable gift in the world. Memories that will forever help us go back to the beginning.